Hello everyone! I am Christine from Design Esquire. Chris asked me to share how I chose my sewing machine. I bought a new machine last summer when I started sewing, so I thought this topic would be perfect! I should preface this post by saying that during the process of looking for a machine, my goals changed from wanting to get something as cheap as possible, to buying a mid-level machine that I could grow with. That said, I would like to start by saying that if you're new to sewing and not sure how you are going to like it, I would highly recommend borrowing another person's sewing machine and practicing on it for a little while before investing in a new one. That way, you won't end up with a new machine still in its box sitting in your basement. Unfortunately, I did not have any friends or family with sewing machines that I could borrow. After taking an intro to sewing class at Joann's Fabrics, I really wanted a machine to start sewing with so I started looking to purchase one. First, I looked on Craigslist and called around to sewing repair shops in my area to see if I could find any good used machines cheap (I am a bargain hunter to my core). I feel like Craigslist is very hit or miss. I will admit I was impatient to start sewing, so I only looked through the ads there for about two weeks and didn't see anything that was worth buying (it was all overpriced or very, very old). My husband also pointed out that since I was a beginner, I should think about buying a machine with its user manual so I would be able to troubleshoot when something acted funny on the machine and so I could learn new features. (He is so smart!) There are not a lot of sewing machine repair shops in my area, and the ones that were still open, didn't have any machines to sell. I then called around to specialty sewing stores that sold sewing machines, to find out the price range of the machines. Most had some sort of basic model that started at a little over $200 and then had fancier machines that would cost more than $1,000. One advantage of going with a specialty store is that they may offer free classes when you purchase a machine and, of course, they are likely to be very knowledgeable and help you purchase the right machine for you. 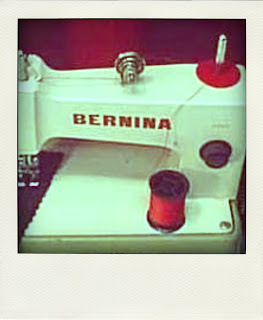 Around this time, I remembered that one of my favorite bloggers, Darby from Fly Through My Window had done a post about a year earlier on buying sewing machines. You can find the post, HERE. Her father bought her a Kenmore sewing machine from Sears. So, I emailed her to see how she liked the machine a year later, and she emailed me back that she LOVED it. (Can I just mention how much I love blogging - people are so generous with information!). As you may know, Kenmores are made by Janome, so they have a reputation of made well. Darby had the Kenmore 19233 from Sears. Sears carries a number of Kenmores and many other brands in a wide price range and Sears allow customers to post reviews of their products online. After Darby's endorsement and reading the reviews online at Sears, I thought about purchasing the same machine. My research showed that I could get more of a machine for the money from Sears than from a specialty store -- but, that meant I was losing some of the "intangibles" that those specialty stores offer like free classes to learn how to use your machine and having an informed salesman help me purchase my machine. Before pulling the trigger, I did some more research at the website Pattern Review. It is free to sign up, and you can access all sorts of information. There is a comprehensive sewing machine review section where "real" sewers review different machines. I was very happy with the reviews for the Kenmore 19233, so that is the machine that I ultimately ended up buying. I love it and have been very happy with sewing with it. While it was about $150 more than I originally thought I would spend, I thought the price was fair for the number of features it came with. While not cheap, it cost me around $400 on sale, it was computerized, came with about 9 feet, a DVD instructional video (great for a me as a beginner) and lots and lots of features that I could grow with as I learned to sew. I also purchased the extended warranty, because I was terrified I was going to break the machine somehow. The warranty also included annual cleanings, which I thought might be useful. So, that's my (long) story! There are so many good machines out there to buy, and this is just my tale on how I ended up with the one that I have. I would just like to add that 1) I do not work for Sears and 2) this process is not "one size fits all". Luckily, there are lots of good places to get a machine to fit your needs. Chris, thank you again for asking me to be a part of this series! I am truly honored to be included with all the other talented bloggers! Thank you, Christine! (Love your name by the way.) Check out Christine's blog, Design Esquire, and see all the fun projects she's completed like this bag and these kitchen accessories. Chris, thanks again for asking me to be a part of your Sewing 101 series. I had so much fun putting this post together! I bought a new machine a few years ago, but you have some great suggestions here. You can spend a lot of money on some of those machines! I'm really enjoying this series and like this post. I do want to point out that if you are not able to spend $400, you can do just fine with one of the Brother or other machines from Wal-Mart for quite a long time. Or at least I did. Understanding thread tension and using sharp needles got me past a lot of the problems I thought were due to a cheap machine. Great point, Sheila. The machine you pick is important...but as important are the needles, tension, and thread. I'm so glad I found your site! I went to Walmart got a Singer, only after I purchased a Viking for nearly $500 which was the biggest mistake. If you need service you must go back to where you purchased it. I moved and now have to travel over one hundred miles! And I'm still under warranty. Hi, I am just starting to learn sewing. I love the way you have set up this sewing area. Can you tell me where you bought the table and storage basket cart shown in the photo? It's so clean and simple. Have looked everywhere and can't find anything similar. Thank You for this series of articles. I have a Kenmore that is basic (not computerized). It has never been serviced and I have never had any trouble with it that I could not figure out. I oil it occasionally and run it incessantly. My mom has a computerized Kenmore that I sew on when I visit her. I really like that one too. If I could, I would acquire a machine to do lovely machine quilting (such as a long arm). Other than that my machine serves me well.